18.09.2009: Lithuanian sets blistering pace in first qualifying Kazim Vasiliauskas stormed to his maiden F2 pole in the first qualifying session at Imola today (Friday), eclipsing his rivals by more than three tenths of a second. Kazim Vasiliauskas stormed to his maiden F2 pole in the first qualifying session at Imola today (Friday), eclipsing his rivals by more than three tenths of a second. The Lithuanian backed up his earlier claim of wanting to fight for victories, as he set the fastest lap of the weekend with a 1:38.468s: "I'm really happy," said Kazim. "I see that every time I am improving, and now this is my first pole, I am just so happy. At the first race in Valencia my father told me if you are in the top ten I will be very happy. Now, at the end of the season, I have a pole! Tomorrow I will try to make progress and take my first win of the year." Mirko Bortolotti pipped Mikhail Aleshin to second place, but the Italian was upset with his colleague after Aleshin allegedly blocked him on his final run. It is the second time in as many meetings that the Red Bull duo have had a difference of opinion. "It was a bit frustrating because the pace was there to get pole," commented Bortolotti, "but on my fastest lap Aleshin stopped me, so I don't know what to say. In the end I am happy because I got second position, but it could have been better for sure. Still, first row is a good result and it gives me confidence for the race." During the post-qualifying press conference Aleshin simply said he hadn't seen Bortolotti in his mirrors, but the Russian had a complaint of his own: "I think that many people were pushing under the yellows, and I think it will be a good decision if the FIA investigate this a little," he commented. "In my opinion I was the only one slowing down." Robert Wickens completed a Red Bull 2-3-4 as the Canadian left it late to see off Philipp Eng. The Austrian was second behind Vasiliauskas with only five minutes to go, but he may have paid the price for aborting his final run. Championship leader Andy Soucek may be content with sixth on the grid as he looks to wrap up the title this weekend, but the Spaniard earlier admitted he did not have the pace to challenge for pole. Sebastian Hohenthal ended up seventh ahead of a mighty impressive run from Germán Sánchez. 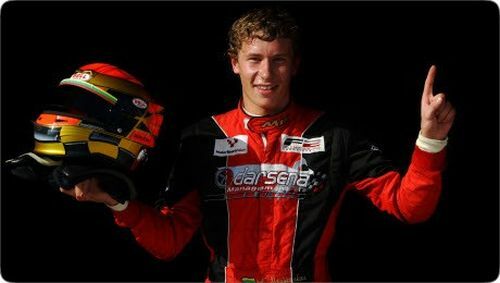 The reigning Spanish F3 champion recovered from an early spin to score his best qualifying position of the season. After setting the pace during the opening practice session, Julien Jousse will be disappointed with ninth, whilst Edoardo Piscopo will have to fight for his first F2 podium from tenth on the grid. Armaan Ebrahim spun out of the session at Rivazza on his first flying lap - the Indian pilot will start tomorrow's race from the back of the grid. Jens Höing also crashed out late on, whilst Jolyon Palmer and Jack Clarke recovered from separate off-track excursions. Wickens endured a mixed session after bouncing back from a double-off on the same lap, but Tom Gladdis wasn't so lucky - the Englishman was left stranded in the middle of the circuit on the exit of Tamburello as the chequered flag waved.